Have a fun summer, Lisa! Have an awesome summer, my friend. See you in the fall. 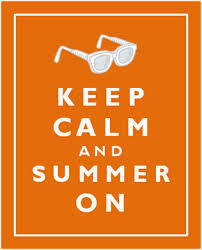 Enjoy your summer. Will look forward to your return. Thanks for the fun, Lisa. Bask, baby, bask! Enjoy your break! See you when you get back. Wishing you a wonderful summer too! Enjoy your summer, Lisa. I look forward to reading your posts again this fall. What a great idea! Every routine becomes tedious after a while, so get refreshed! Thanks, Judy, you too! Have a wonderful time in Syracuse. My daughter is chomping at the bit to get back there! It seems we are both ‘working’ the summer vacation, huh? Have a fabulous one Lisa!